What a special gift to offer a forever home to a shelter animal. As is the case all year round, shelters have thousands of incredible companions available for adoption. The holidays are a popular time for bringing these new furry friends home. Remember that deciding to promise a home to an animal is a big decision. You may want to consider virtual adoption first. Even though our house may be full right now, we still enjoy being Santa Claus to all the animals at our local shelter. If you’re ready to open your home and your heart, remember that millions of animals are eagerly waiting at shelters, and that when you adopt you truly are giving the gift of life. Virtual Adoption is a process in which we advocate for particular shelter animals and give them a voice. In doing so, we hope to find them a forever home outside of the shelter. Through virtual adoption, we get the chance to meet the animals in our local shelter, engage with them, and care for them. If we’ve got all the furry friends at home that we can handle, or if we are not in a position to adopt, virtual adoption still allows us to take a needy shelter animal under our wing. It gives us the chance to make a difference in the lives of dogs and cats in need, help the busy shelters to care for their animals, and all the while encourage those around us to adopt and not shop. Volunteer your time at your local animal shelter and get to know the dogs and cats there. 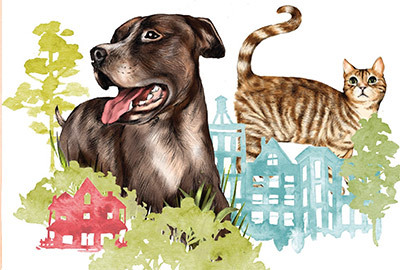 Choose an animal for virtual adoption, one that you would like to find a good home for. Mutts, pit bull types, black cats, and seniors are all examples of animals that have a hard time finding forever homes. Ask the shelter volunteers about the animal’s background and why she has ended up at the shelter. Be inspired to help your chosen friend find her forever home. Animal Haven Shelter has lots of animals who would love to be the focus of your first virtual adoption. It’s important to keep shelter animals mentally and physically active to ensure that no behavioral problems develop while they’re in the shelter and to allow them entertainment while they wait to be adopted. Cats can use toys to keep occupied in their cages, and dogs love to be kept busy while they wait to be taken home. Shelter enrichment toys do not need to be fancy or complex. Simply crafting clever items out of recycled materials will suffice and make a world of a difference for the shelter animals. Host a shelter-crafting day and create a bunch of easy-to-make enrichment toys to donate to your local shelter. (Some of the projects in the At Home chapter of Do Unto Animals might be fun to try.) Don’t forget to give some toys to your chosen shelter animal! Posters featuring your virtual adoptee help to spread the word about their need for a good home. 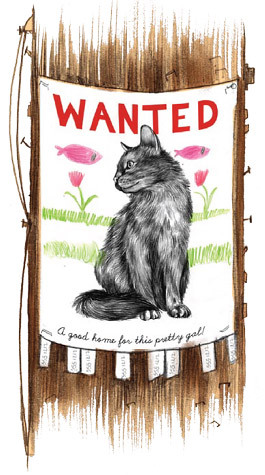 Make posters that are colorful and interesting and feature personal details that help potential adopters feel connected to the animal. Add photos and supply all necessary information for the shelter, including directions, a contact number, and the hours of operation. Cage cards are another clever way to help your animal get adopted. These are the little display notes that are posted on the outside of shelter cages. They provide potential adopters and shelter volunteers with important information about the animal and can include their favorite toys and food, stories about the fun you’ve had together, and what you believe your animal is looking for in a forever home. They paint a clear picture of who the animal is and the kind of home that would be right. Simply telling people that you’re volunteering at your local shelter and participating in virtual adoption helps spread the word, too. Just by sharing what you’re up to, you’ll be informing others about the cats and dogs in shelters everywhere who are waiting to be taken to a forever home. Social media has been a godsend to animals in shelters. Instead of posting what you had for dinner, post about an animal in need of adoption! It’s a great day and a great feeling when your shelter animal gets adopted! Before choosing a new animal to advocate for, celebrate your success by finding a way to document the work you’ve done. Keep a journal or post photos on a bulletin board to commemorate the moment. Make a blog post, update your social media newsfeed, or find another way to spread the word and thank others for their assistance in the project. Talk about it when people ask what you’ve been up to lately. Who knows, you might inspire your friends to try virtual adoption themselves!